Vietnam’s stock market neglected a rally of global equities, extending its losing trend for a third consecutive day on July 28, as blue chips continued to retreat while penny-chips were not able to pilot the market. VN-Index, a gauge of 250 companies and four mutual funds listed on the Ho Chi Minh Stock Exchange, tumbled 1.34 percent, or 6.67 points, to finish at 491 points. On the city bourse, losers outnumbered gainers, as only 22 stocks improved. Meanwhile, 199 fell, and 33 were unchanged. Trading volume rose slightly to 46.8 million shares, worth VND1.38 trillion. Foreign Trade Development and Investment Corporation of Ho Chi Minh City (FDC), which advanced 2.61 percent to VND47,200, topped the list of most active shares by volume with 1.63 million shares changing hands. From July 30 to September 30, Tran Dang Tien, deputy general director of Foreign Trade Development and Investment Corporation of Ho Chi Minh City (FDC), registered to sell 12,500 shares, and buy 20,000 shares, sending his holdings to 30,565 shares, restructuring his investment category. In the same period, Nguyen Bang Nguyen, the company’s chief accountant, registered to sell 3,100 shares, and buy 5,000 shares, bringing his holdings to 7,584 shares, for the same purpose. Between July 30 and September 30, Nguyen The Hau, deputy general director, also registered to sell 41,500 shares, and buy 20,000 shares. His holdings will be at 61,927 shares after the transaction is completed. Refrigeration Electrical Engineering Corporation (REE) chased after with 1.11 million shares. Transport company Thuan Thao Corporation (GTT) came in third with 1.06 million shares changing hands. Shipping company Gemadept Corporation (GMD) contracted 27.78 percent to VND39,000. The company will issue 32,141,667 additional shares for its current shareholders with a ratio of 3:2 and a price of VND20,000 per share. This is a part of the plan to release 51,787,500 shares to increase its chartered capital to VND1 trillion. An amount of 2,410,625 shares will be sold to the company’s employees at a price of VND20,000 per share. In addition, a total of 17,235,208 shares will be offered to its strategic partners. Binh Thuan Hamico Mineral Joint Stock Company (KSA), Petrolimex International Trading Joint Stock Company (PIT), Viet Nam Petroleum Transport Joint Stock Company (VIP), Vinh Hoan Corporation (VHC) a seafood company, and Tien Len Steel Corporation Joint - Stock Company (TLH) all gave up 5 percent. Among a few gainers, Dong Phu Rubber Joint Stock Company (DPR) advanced 5 percent to VND63,000. The company announced that it would contribute VND20 billion to Dong Phu Technical Rubber Joint Stock Company’s (Dorufoam) chartered capital, raising Dorufoam’s capital to VND110 billion, and its holdings ratio at Dorufoam to 50.9 percent from 40 percent. Sao Mai Construction Corporation (ASM) added up 4.86 percent to VND75,500. The company asked for an extension to present its financial statement in second quarter of this year to the end of August 5 because its computer software was broken. National Seed Joint Stock Company (NSC) surged 4.52 percent to VND39,300. 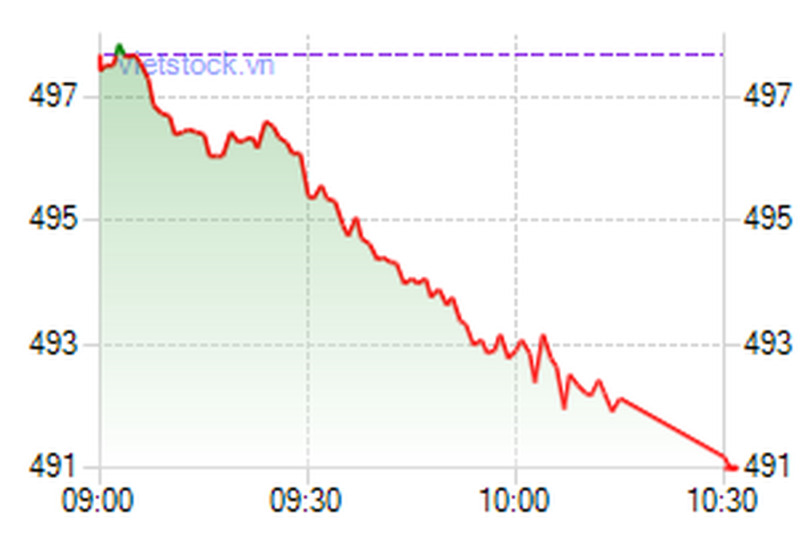 Hanoi’s HNX-Index closed at 152.38 points, down 1.64 percent, or 2.54 points. Around 34.4 million shares changed hands worth more than VND1 trillion. The UPCoM-Index dropped 0.88 points to 52.15. A total of 453,780 shares traded at a value of VND8.9 billion as of 11 am local time.